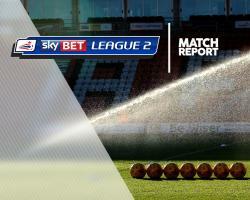 Promotion-chasing Stevenage were held to a 0-0 draw by Cambridge in Sky Bet League Two. Luke Berry came closest to opening the scoring in the first half but saw his effort following Piero Mingoia's low cross deflected narrowly off target. Berry powered another attempt just wide of Chris Day's near post on the stroke of half-time. The match was a stop-start affair, with Tom Pett going off injured in the first half for the visitors, who then saw Fraser Franks and Connor Ogilvie both require treatment after a nasty clash of heads early in the second period. George Maris screwed a shot wide when well placed from a Barry Corr knock-down, before Stevenage wasted their big chance 18 minutes from time when Leon Legge gave the ball away in a dangerous position to top scorer Matt Godden, who fired just off target with Will Norris beaten. Michael Tonge saw a free-kick saved by Norris, while Berry headed wide at the other end as Stevenage lost ground on Portsmouth in the race for automatic promotion.